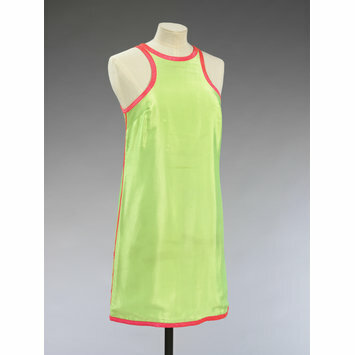 During the 60s, Bates designs were at their most modernistic. The most futuristic of his mid-60s designs featured bare midriffs, sheer panels, and very short hemlines. Marit credited him as the creator of the miniskirt, rather than Mary Quant or Courregés. 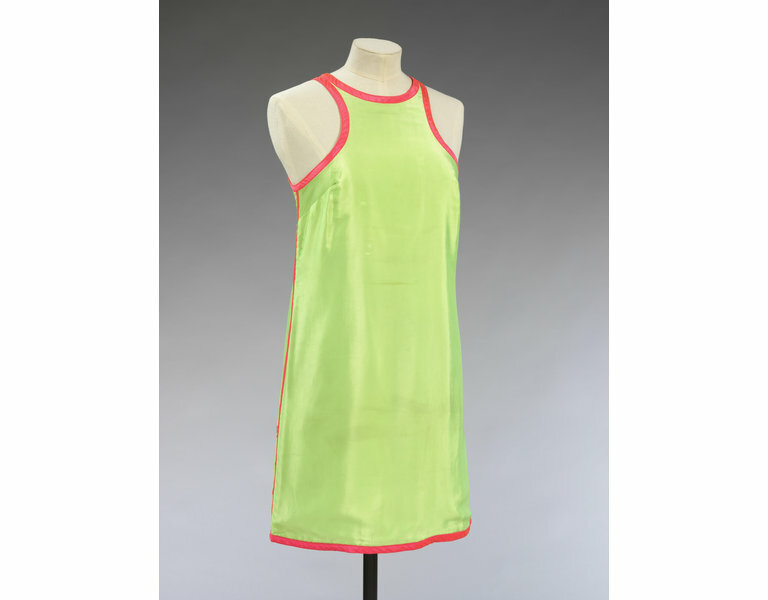 This fluorescent green micro-minidress is made from a shiny nylon-blend fabric with a machine-like sheen. The simple straight-cut silhouette, deep armholes, and contrasting pink binding to the seams emphasise its sporty youthful quality. 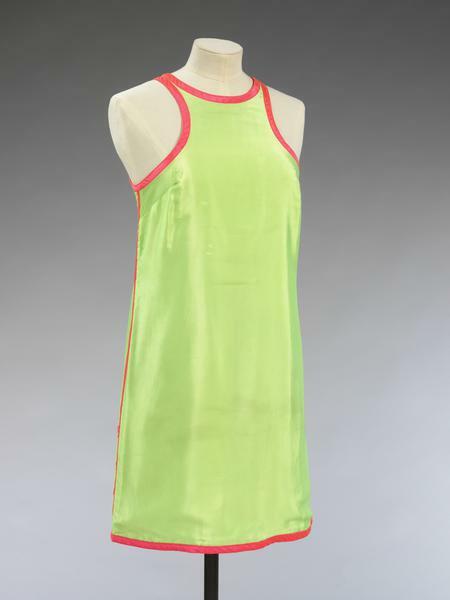 This dress was worn by the fashion journalist Marit Allen (1941-2007). She entered fashion journalism in 1961 when she became an assistant at Queen magazine. She quickly gained control of the "About 20" pages of the magazine, in which she showcased young design talent and innovative photography. When Beatrix Miller, the editor of Queen, went to edit Vogue in 1964, she took Marit with her. For ten years, Marit Allen worked as a fashion editor on the magazine. Her "Young Idea" pages, written and captioned by herself, showcased innovative young design and fashion, and had a great influence on 60s fashion. Marit Allen was often photographed for her own stories. John Bates was one of Marit's favourite designers and became a close friend of hers. He was chosen to do her wedding dress. Marit championed Bates, and insisted that he was the true creator of the miniskirt, rather than Mary Quant or Courrèges. Bates' 60s designs were very adventurous - he bared the midriff, used vinyls - including transparent vinyl - and raised hemlines. The graphic silver and white ensemble he created for Allen's wedding encapsulates much of his work in the mid-1960s. This extremely short minidress is another example of Bates' mid-60s work.